It’s Friday Food and I’ve got two recipes for you – both modified by me to be gluten-free! Getty just waiting to eat! A few weeks ago, the whole family got in on making Honey Cashew Chicken with Rice from Cooking Light magazine (June 2012). This was a great recipe – spicy but also sweet! I used leftover chicken to make this which made the recipe much faster, Finn (our three-year-old) shelled the edamame, Brian tasted the cashews before they went into the recipe and Getty watched us cook! 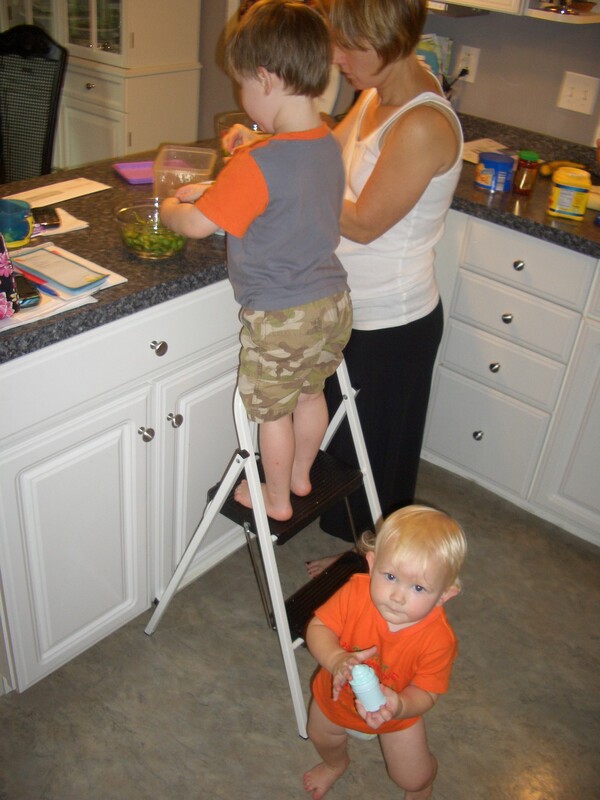 Finn had a great time helping and shelling one cup of edamame kept him occupied for a LONG time. He loved saying “edamame” and kept saying, “we’re all working together as a team!”. He was so proud of himself and ate a lot of this meal. I’ll definitely make this asian-inspired dish again, but will make about twice as much sauce with it. It needed a bit more sauce. To make this gluten-free as we did, make sure you use gluten-free soy sauce San-Jand also a gluten-free hot chili sauce. Everything else is naturally gluten-free. 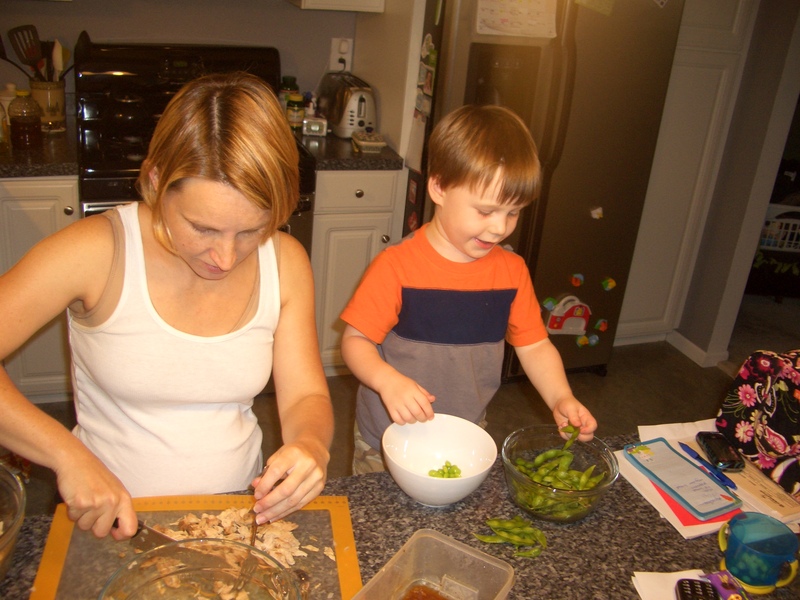 Finn helping mama make dinner, shelling that edamame! Preheat oven to 350 degrees and coat a 9×13 pan with cooking spray. In a medium bowl, whisk together the flour, baking soda, cinnamon and salt. Set aside. In another bowl, using a hand or stand mixer on medium speed, blend the butter and both sugars until pale and fluffy (about 3 minutes). Add the eggs and the vanilla extract and beat until well blended. 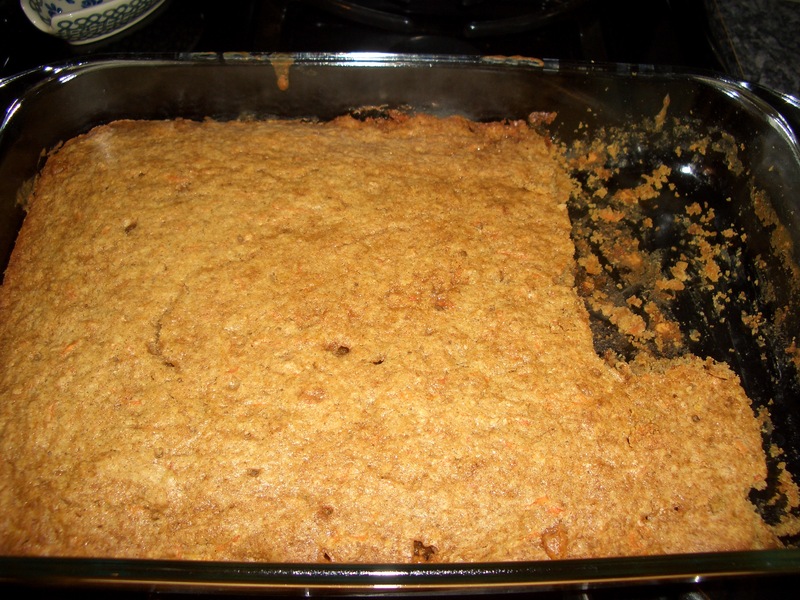 Reduce the mixing speed to low and add the carrots. Mix in the butterscotch chips and if desired, the walnuts. Use a wooden spoon to mix the flour mixture into the wet ingredients, scraping down the sides as you work. Poor the batter into the prepared dish and spread evenly. Bake at 350 degrees for 30-40 minutes. Bunny blondies about 10 minutes out of the oven – we couldn’t wait to dig in!! Have a great weekend and cook up some of your own Friday Food! Remember, we’re taking the week off next week to reorganize and we’ll be back on October 1st! See you soon!